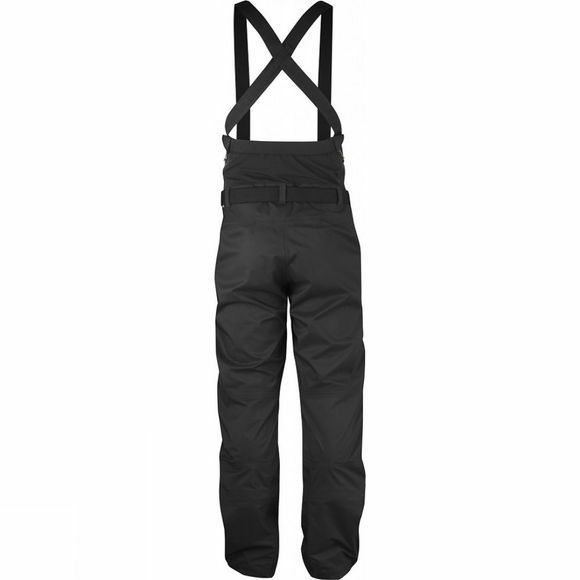 Technical wind and waterproof three-layer bib trousers with braces for ski touring and trekking in cold conditions. The Men's Keb Eco-Shell Bib Trousers are made from stretchy Eco-Shell for high performance and the lowest possible environmental impact. The material follows the movements of the body naturally and ventilates out moisture that builds up inside when you are active. It is perfect for long days in the mountains, whether you are ski touring, ice climbing or trekking along wide valleys. The minimalistic design gives a useful garment that facilitates the push forward at the same time as the trousers have the level of functionality needed to protect you from harsh winter conditions. The cut has been carefully worked through and the trousers are roomy enough for an insulating layer underneath and for maximum freedom of movement. 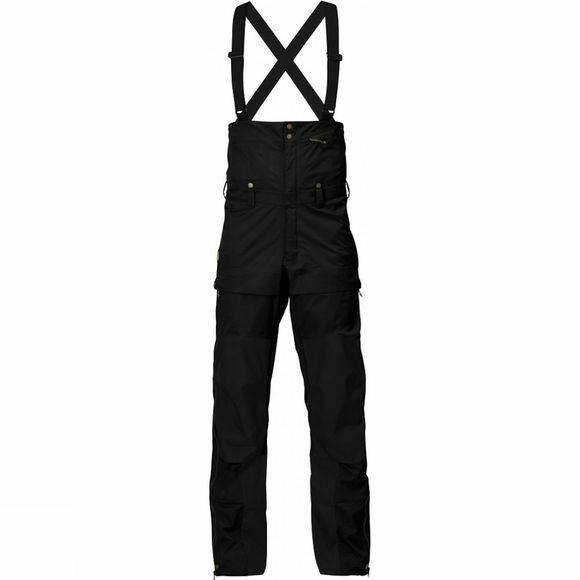 The high waist has an elastic back panel that warms your core and stops snow from getting in. The braces are positioned so the rear section can be opened for hassle-free toilet visits. The long two-way water-resistant zips at the sides let out excess heat and simplify putting on and taking off, making it unnecessary to take off boots or skis. The two spacious leg pockets with bellows have room for a map or gloves, for example. In addition, there are two pockets at the waist, one outside and one inside, both with zips – practical for storing batteries for better performance in the cold. The fly has a two-way zip for extra ventilation. Cordura reinforcements on the knees and inside of the legs can withstand hard wear from rocks, crampons and ski edges. The leg endings have a button and a hidden drawcord to adjust the width, plus snow locks and boot hooks to keep the leg endings in place when moving about in deep snow.